The Best People: Not only do our employees share our fundamental commitment to getting the job done on time and on budget, they bring leading industry expertise, progressive thinking, and aggressive problem-solving to every job. They are the best in the business. Just ask our customers. Unsurpassed Project/Program Management: WFI is built upon a core competence of program and project management. It’s at the heart of every project, allowing seamless integration of all the teams involved in network deployment, from start to finish. We carefully monitor scope, time, cost, quality assurance, communication, tools, resources, procurement, safety, and training. It’s what allows us to consistently exceed our clients’ expectations. Quality Assurance: WFI supplies quality products and services while maintaining the highest levels of ethical standards. Our Quality Assurance System ensures continual process improvement, innovation, training, teamwork, and the willingness to change and move forward. The result? Excellent products and services, delivered on time and cost effectively. Not only does WFI ensure that our system is being implemented company-wide, we also regularly audit the quality of all our vendors, ensuring their compliance, accountability and integrity on each and every job. 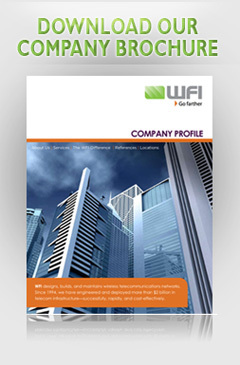 A Focus on Profit: WFI gets the job done, profitably—for the customer and for our company. We add value that creates profit for our customers through reduced costs and speed to market. Our focus on the bottom line is what sets us apart from our competitors. We know that profitable jobs are jobs that get done right, on time and on budget. It’s what wins our customers’ trust, boosts our reputation, and builds our business.